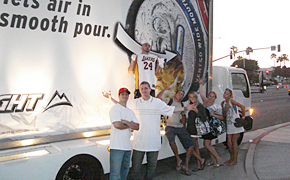 Since 2001, EYE CATCHING MEDIA has been serving customers in a variety of states by providing an alternative approach to advertising – mobile billboard advertising. Imagine the impact that your advertisement can have when it is on a mobile billboard truck that is driving around town. Your ad will always be moving, which means your advertisement will be covering a wider geographic area than a regular billboard. Mobile billboard advertising catches potential customers’ eyes, which makes it the ideal way to promote a product, business, or an upcoming event. Gain recognition and brand awareness for your business with the precision targeting of our mobile billboards. 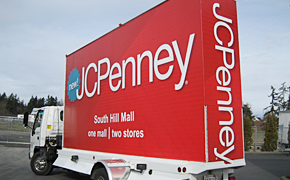 By placing your advertisement on one of EYE CATCHING MEDIA’s mobile billboard trucks, you will reach numerous customers that other advertising platforms cannot reach. Our company has a fleet of trucks fabricated into full-size billboards which allows us to take your ad campaign directly to the people by traveling throughout the city. Request an estimate to promote your business, product, or event on a mobile billboard by calling our team at (253) 218-3179 today. We will provide you with affordable rates because we understand the importance of showcasing your ad without costing a fortune. Our service area includes cities in Arizona, California, Idaho, Oregon, and Washington. Make an impact with mobile advertising. EYE CATCHING MEDIA offers affordable advertising services—we give you the best rates in the mobile advertising industry. Our drivers are professionals with many years of experience, and our trucks are clean and well-maintained. We've been satisfying business owners and advertising agencies with high-quality advertising products since 2001. Our company is based in Lake Tapps, Washington, east of Tacoma, and we primarily serve the West Coast. We currently have clients in Seattle, Tacoma, and Spokane, Washington; Sacramento, San Francisco, Los Angeles, and San Diego, California; Portland and Salem, Oregon; Phoenix, Arizona; and Boise, Idaho. Call us or email us your target area and we can talk about routes and rates.